How is it we know that a movie is exceptional? One of the ways that we can reach such conclusions is by making comparisons to other films. A movie that is mundane will pale in comparison to something really strong. Excellence can therefore sometimes be measured by mediocrity. That’s why we need films like “The Mummy”, they show us how good films like “Wonder Woman” really are. I am not implying that this movie is bad, simply that it meets no standard for greatness except one, and that is the most obvious selling point for the film, it stars Tom Cruise. I am probably a Cruise apologist. Of the forty plus movies he has made, only a handful have been clunkers. I would include his last film, “Jack Reacher: Never Go Back” in that handful of dismal efforts. This film is miles better than that weak sauce film from last year, but that does not make it great, it makes it average. Cruise as usual is winning in his role, in spite of the fact that his character is designed to be a thoughtless douche-bag who fails to follow orders as a soldier, steals from women and generally engages in the kind of archeological theft that Indiana Jones was accused of, without having any scholarly justifications for his actions. Tom just has charisma and it turns even vile characters into people we are willing to watch. As I said, this is the one big selling point of the movie. Cruise puts in as much effort as anyone can to try and bring this story to life. The film is basically an action movie with a horror theme that needs to be a little more horrifying. There are a few creepy moments, like the camel spiders and rats that seem to be under the command of the villainess of the story. An ancient creature inadvertently raised from the dead and determined to bring the evil lord she made a pact with into the flesh, she has chosen Tom’s character Nick, to be that vessel. So there is a monster and a curse but there are also stunning aerial stunts and chase sequences. With a half dozen jump scares that become progressively less effective, the film barely feels like a horror movie at all. Still it is mildly entertaining in creating a universe for these characters to exist in and providing a series of hoops for them to jump through. A few of the things that make this movie passable include the two female leads. Sophia Boutella as the ancient princess returned to the world looks exotic enough and she grimaces well in conveying a sense of evil. Annabelle Wallis is sweet enough for us to sympathize with and hope the best for. Neither could carry the movie but they don’t have to with Cruise in control and a scenery chewing middle aged matinee idol ready to turn into Mr. Hyde at any moment. Just like the pygmy zombies that were so fun in one of those Brendan Frasier Mummy movies, this update has something cool to sell it in the effects department. zombie crusaders. They are solid and they look especially creepy in the water. A lot of people have been bad-mouthing the start of a new “Dark Universe” from Universal Studios, but everyone else in the film business has a steady supply of material to exploit and Universal is simply trying to keep up. Their iconic monsters are laying around doing no one any good unless new stories are written for them, so the studio is following up. The paranormal team led by Dr. Jekyll, played by Russell Crowe may not be the Avengers, The Justice League or even Transformers, but hey can be entertaining if given a chance. I can’t say this film is a bright start to that future of serialized stories, but it is not the failure that others would have you believe. This a a popcorn picture, disposable as any other fast food product of our consumer society. There is a place for romance novels in literature, hamburgers in dining circles and Fords in the car business. 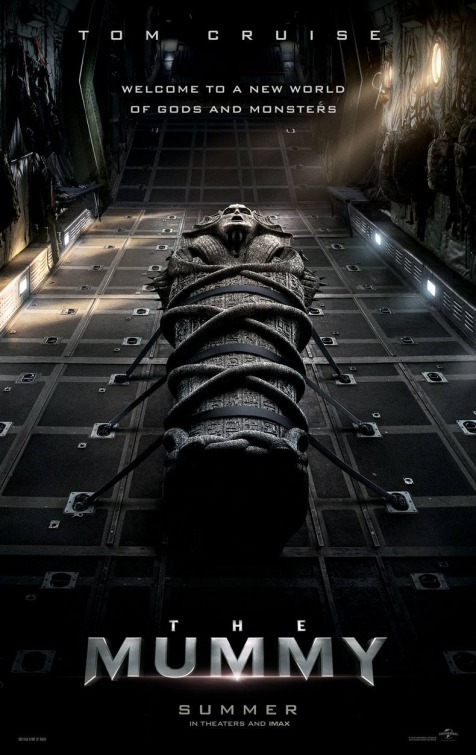 “The Mummy” reminds me of one of those mid-range sedans from Ford, it will get you where you are going but nobody will be bragging about the cool ride you showed up in. You may look over at that Lincoln in the next theater, but if you have already driven it and know what a nice ride it is, watch this film. It will fill your two hours and remind you that it is just a car, and there is luxury out there that you can still aspire to.